Few people write political manifestos anymore – certainly not intellectuals normally work­ing in universities. Political manifestos against the political world order are even more rare. Empire, by now the Bible of the anti-globalization movement, is a notable exception: a solid and even hermetic ­philosophical treatise that is also a political manifesto, according to authors Hardt and Negri. A few years ago, Empire was ranked high on the sales list of Amazon.com, surprisingly for a book in which St. Augustine, Spinoza, Marx and Foucault set the tone. 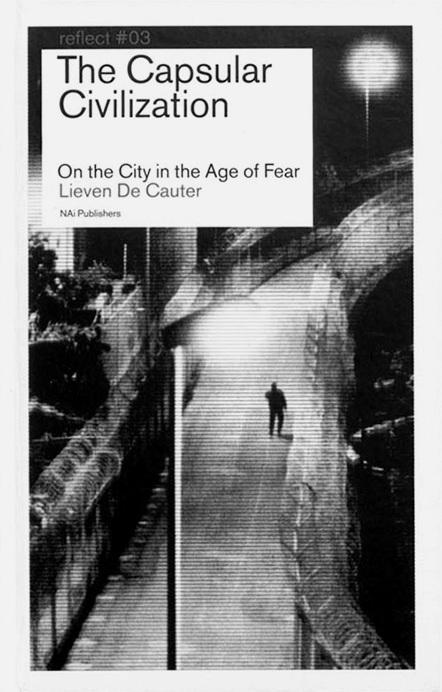 The Capsular Civilization – On the City in the Age of Fear, by Flemish art historian and philosopher Lieven De Cauter, is not as complex or hermetic as Empire, but it is, like Hardt’s and Negri’s tome, both a solid and complex philosophical dissertation and an impassioned political manifesto. In this sense, the book ﬁts in perfectly in NAi Publishers’ ‘Reflect’ series, which aims to focus attention of relevant social issues in architecture, urban planning, ﬁne art and design. At the same time, this book surpasses the scope of the series: De Cauter begins his book, a collection of edited essays written between 1998 and 2004, with the problems of the contemporary city and urban culture, but it quickly becomes clear that he has a far broader and weightier subject in mind: nothing less than the (threatened) future of the ­planet. In a certain sense, the recent history of the city and of urban culture serves as a sort of case study for a broader issue, which De Cauter mostly refers to as the rise of a ‘capsular civilization’ but sometimes also as the establishment of ‘transcendental capitalism’ (a capitalism without antithesis) and also, in a more political sense, as the New Imperial World Order. Such a broaden­ing of the subject has consequences: what began as a contribution to the ‘political aesthetics of the city’ (the urbs) grew into a book about the future of the city as civitas, as a ‘human city’, as a society in general. The political events of the last three years inexorably shifted the focus of De Cauter’s text onto a more general, more political and more immediate plane, but this was already the partly hidden focus of his intellectual project. De Cauter’s philosophical work is strongly influenced by the phil­osopher to whom he devoted his doctoral thesis, De dwerg in de schaakautomaat. Benjamins verborgen leer (Nijmegen 1999): Walter Benjamin. Benjamin combined a philosophically and scientiﬁ­cally informed ­critique of the prevailing ­optimism of progress (of a positivist-liberal and Marxist slant) with a half-­hidden mystical Messianism, in which attention to and study of history were approached in terms of ‘salvation’ – in short, they always had an acutely normative focus. The fact that De Cauter’s book gives new content to Benjamin’s intellectual position is not surprising: Benjamin has played a major role in cultural theory debates in the last twenty years. What is surprising is the way in which he does this. De Cauter’s work is not charac­terized by the theorems of scientiﬁc and cultural ­criticism of the critique of ­progress that dominated the post-modern agenda, but rather by the Messianic theorems of salvation. It is precisely this semi-mystical, theologically inspired theme that pervades the book and draws heavily on the attention to the many subterritories De Cauter explores and comments upon. Sometimes it works, sometimes it doesn’t. Against Koolhaas’s cynical realism and the naïve, but unin­tentionally prophetic urban political interventions of the Situationists and other avant-gardes of the 1960s, De Cauter develops his great critique of the capsular civilization, which he illustrates with concrete descriptions of an urban space increasingly taken over by ‘capsule formation’, in other words the emergence of a network of enclosed, inward-directed urban spaces that are dominated above all else by control, and thereby potentially mean the end of the fundamen­tal, albeit always contentious, openness of the classical modern form of urban life and urban space. From malls to airports, from amusement parks to suburbs: everything is increasingly taking the form of a capsule. Many of his exam­ples are persuasive, and his detailed analyses indeed cry out for more material. His attempt to outline a general theory of the new (post-) urbanness (‘The Capsule and the Network’) is also challeng­ing and stimulating, precisely in its self-critical awareness of being partly a ‘prophecy of doom’ – but therefore all the more relevant from a Messianic standpoint! His resistance against the neo-liberal pep talk that has contaminated virtually every political, academic or cultural debate in recent years is also persuasive. In the second part of the book the capsular civilization is unequivocally linked to the geopolitical issues of ‘the new world order’, globalization and the war between Bush’s United States and terrorism. This connection is correct, in my view, and as far as I’m concerned it cannot be made often enough. It is essentially the connection between the politics of everyday urban life (from migration, immigrants and natives, crime and violence, but also education and multiculturalism, etcetera) and the broader issues of politics and economics, imperial or not, on a global scale. This connection is far too rarely made, and for that reason alone the second part of De Cauter’s book is of great signiﬁcance. It is far less successful, however, in terms of rhetoric and argumentation. Here the activist wins out too often against the intellectual and the philosopher. We get too many reminders of global warming, the explosive growth of the earth’s population and the ­perverse power plays of the Project for the New American Century (PNAC) of Rumsfeld, Wolfowitz and Perle, the neo-conservative think tank behind the new imperial and interventionist American policy of George W. Bush. We’re already familiar with the facts through Benjamin Barber, Michael Moore, Alain Joxe and many others. Like De Cauter, many will be outraged by it all. De Cauter enumerates multiple forms of anger, repeats this several more times – and what’s the result? Outrage. I certainly became angrier thanks to De Cauter’s book. As a manifesto against the New Imperial World Order, The Capsular Civilization is at times quite compelling. But in its consideration of possible alternatives or solutions, the second part of his book is intellectually unsatisfying. The digression on Giorgio Agamben’s Homo Sacer, on the basis of which De Cauter analyses the current political world order as a legal state of exception (a kind of ‘state of emergency’) is too summary and hermetic in its argumentation to provide support for the activism that exudes, as it were, from the very pores of his argument. To sum up: this is one of the most challenging collec­tions of essays on the city and urban culture in recent years and also one of the few books to take an explicit political stand in the debates about the city, which are usually quite conventional, policy-oriented and ‘realistic’ in nature. It is also a courageous book, which adopts a Messianic tone that, though tricky to justify, is not out of place, but rather sorely lacking, in the current political and intellectual climate. Too bad the debate about the city is ultimately overtaken by an overdose of anti-imperial activism. The activism is legitimate in itself, but in a book with such all-encompassing claims on the city, its effect is counterproductive. René Boomkens is a professor of social and cultural philosophy at the University of Groningen (RUG). His books include Een Drempelwereld. Moderne ervaring en stedelijke openbaarheid (1998) and De nieuwe wanorde. Globalisering en het einde van de maakbare samenleving (2006).